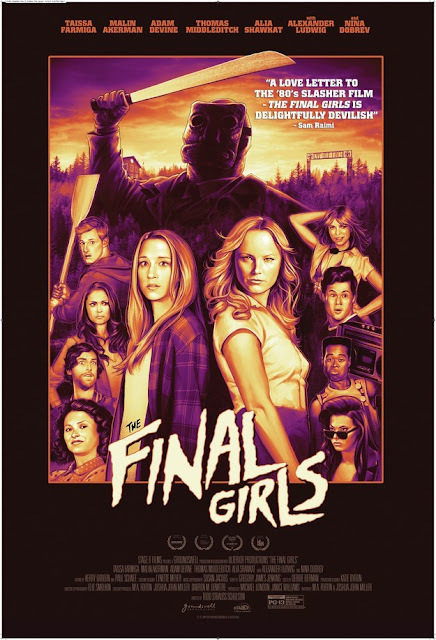 Movies At Dog Farm : The Final Girls (2015) - Saved From Writing The Dog Farm's Final Post? Glad to see you're back, and doubly relieved you haven't given up on movie blogging. You always have such a unique perspective, and that's why I keep coming back here. With that said, I guess I need to check this movie out! It's always rewarding to find a movie that restores your faith in modern filmmaking. I know I've had my doubts from time to time. Take care. Good to hear some barking from The Dog Farm! You voice my disenchantment with the film industry at present, as well. So many directors, I feel, think episodically. So few are storytellers. For instance, I watched Bobcat Goldtwait's _Willow Creek_. His films have been inventive and different in the past, and the hype around WC got me so excited to watch the film. My heart sank when the premise did nothing more than take The Blair Witch formula, component for component, and simply substitute Bigfoot. By no means was this film a major success, but it did get critical praise. That, to me, is a warning sign that the people judging movies do not understand the core concepts--they want only to have impressive parts, not wholes. Much of the ballyhoo centered on the actors and the build up of tension; none commented on how much of a rip off the story turned out to be. While I understand that I sometimes get too caught up in how I wanted the movie to be rather than allow the filmmaker his or her creative license, I so rarely see a film that is unique due to its storytelling capability. When I herald a Christopher Nolan or Guillermo del Toro it is because they tell a story, not just mesh parts. The recent blockbusters, _Jurassic World_ and _Avengers...Ultron_ feel like stitched together parts that don't fit at all. _The Dark Knight_, however, moves with a fluidity that could only come from a well executed story. I will be sure to watch _The Final Girls_ and hope to have the same spark rekindled in myself. I also hope that more film tickle your fancy and allow such discussion. I know you may feel like one voice lost in a chorus, but when that one voice gets all the others singing in harmony it makes for a pretty darn good sound. I had been curious about Willow Creek - Bobcat's God Bless America (2011) was interesting - but it takes A LOT now to get me to watch a found footage flick of any sort. It also came out at nearly the same time Exists (2014) did - also a found footage Bigfoot flick - and I guess I just didn't feel like I needed to watch two different versions of the same movie in close proximity to each other. Even after years of trying not to judge movies based upon what I wanted them to be rather than what the filmmaker had in mind, I still frequently fall into that trap. Thing is, I'm not as hard on myself as I used to be about it because fair or not, if I have to mentally apply an asterisk to my gut reaction then there was probably something about the movie - or the movie's approach to the subject matter - that wildly missed the mark. I'd even go so far as to say that I don't necessarily require that a movie offer a unique storytelling experience, just that it offer a story. The Final Girls is actually a pretty good example of that. The relationship between mother and daughter that the movie is built around isn't really anything groundbreaking in terms of storytelling, but it's implemented well - in a day and age when most spoofy horror/comedies of this sort wouldn't bother to implement it at all. The time is taken to set up the nuts and bolts of the relationship in an effective but economical narrative fashion, both actresses wisely sell this aspect of the story with sincere performances, and the movie is careful about how it gets its chocolate (the relationship) into its peanut butter (the comedy). As a consequence, every other aspect of the movie is more effective. Adrienne watched it with me, and whereas a slasher movie generally only solicits a shrug when a character is offed, we both had an oh-no-not-her kind of response to the fates of several characters. When is the last time you saw a slasher movie that evoked that response. The most recent one I can think of off the top of my head was probably when they offed Randy in Scream II...in 1997! Because the parts that worked in The Final Girls worked so well, I even found that I was able to overlook a lot of nitpicky things that probably would have irritated the hell out of me in other movies. For example, the timeline makes little sense. The slasher movie the kids get drawn into is clearly fashioned after a slasher movie from around 1981 or so, which would make Malin Akerman's mother in present day fiftysomething, which in turn means she would only have been a child when she made it. Along the same lines, there are several jokes - one involving a movie character cracking wise about Michael Jackson's Bad springs to mind - that don't quite match up to the time period the old slasher movie is clearly trying to invoke. I did not care at all, because those details aren't what the story was really about. Additionally, I was sufficiently invested in what the story was really about to cheerfully disregard these inconsistencies while in a lesser movie - one without a story to tell - these inconsistencies would have been the only thing the movie offered me to focus on. I'm probably going to call my horror geek credentials into question when I say this, but I was never nearly as enamored of Cabin In The Woods as everyone else seemed to be. It was undoubtedly very clever and technically proficient, but I really didn't care at all about any character in that movie. Because I had no emotional investment in any of the characters, the movie as whole came off as a very slick and clever clockwork of a film that made little impression on me. I bring this up because Cabin In The Woods and The Final Girls both cover a lot of the same thematic ground. I loved The Final Girls, but I felt very meh about Cabin In The Woods, and my differing reactions mostly come down to the lack of sympathetic characters presented in the latter. Had Cabin In The Woods bothered to give its characters compelling story arcs, then I might have cared. No, you are not losing your Geek cred by not liking _Cabin in the Woods_. Everyone has the choice to pick and choose choices as long as those choices are wisely explained--and that's where you always deliver. Very much Like you every so often a small break is needed, this turns into a hiatus and then it's hard to come back. I've had two long breaks now and I've only been blogging 3 or so years. When I do come back though, yours is always one of the blogs I return to; so know you do have a fan. The Final Girls does sound fun, and I'll be sure to check it out. As for Cabin in the Woods; I did like it though now you come to mention it probably because of it's technical proficiency and artificial cleverness, not it's heart or characters, and it's not a film I've felt like watching again... Need to ponder on this. Thanks for visiting. I've been pleased to see Watching The Dead spring back to life recently. Because zombies, right? Take those breaks when you need to as long as you keep coming back from hiatus. The Final Girls is available to stream, Vern. I watched it on Vudu. And yes, if and when a Dog Farm podcast happens, you can absolutely be one of my first guests!